The Odyssey Flight Ready Black Label FRNS6BL case is specifically designed by Odyssey to perfectly fit the Numark NS6 DJ MIDI controller with the Serato Itch software. It has a front removable V-cut panel for easy access to the front input jacks on your DJ mixer. and controls. Includes rubber feat, ball corners, and heavy-duty recessed handle and latches. 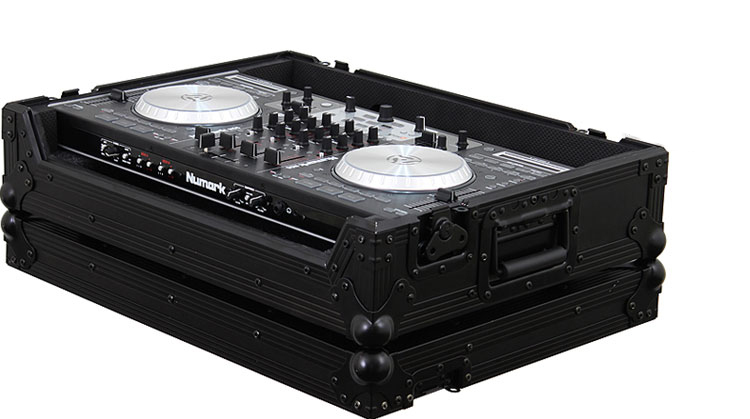 A great ATA case for the mobile DJ on the move and the mix with the NS6. Also available in standard Flight Ready series chrome and black (FRNS6), and in the Flight Zone Series with our patented Glide Style DJ laptop platform (FZGSNS6 and FZGSNS6BL). Controller Compartment is: 23.5" x 12.25"
Approximate Shipping dimensions (exterior): 27" x 10" x 21"